On January 8, 2017, Rev. Tony Ponticello addressed the assembled people at the Community Miracles Center in San Francisco, CA. This was the first service at their new San Francisco location at 875 Post Street. What follows is a lightly edited transcription of that talk. Okay! Once again thank you so much for being here. Some acknowledgements are definitely in order. Let's give a nice round of applause to Rev. Rudy Colombini for all that he has done to make this new meeting space available ("Yeah!" and applause). I also want to mention that our wonderful music guest, Eki Shola1 has some CDs that she would love to have you take home – for a little contribution I am sure. (laughter) She also has a sign-up sheet so you can give her your name and email address. She can then notify you when she's playing. That would be terrific. I really encourage you all to go up and talk to Eki at the end of the service. She'll be playing another song for us a little later on. So, thank you very much and just avail yourself of all those things. The title of my talk today, "Why We Gather on Sundays." I want to start off with the "gather" part. It is very important for me. That word has really resonated with me in so many ways lately. It began when we started broadcasting our Sunday Gatherings on ACIM Gather2. We've been doing that for many months now and that is going very well. I want to say "Hi" and thank everyone on ACIM Gather. Thank you for listening. It is so great that you are out there listening. It is important just to remember how powerful it actually is to gather, to actually come together with other like-minded people. It's very powerful. For me, it's something I definitely need. A Course in Miracles is the discipline that we focus on at Community Miracles Center, although we are broad and focus on other teachings as well. A Course in Miracles talks about "gathering" in various places. When we gather the potential, the power that we have, what we can access is beyond our wildest dreams. It's literally staggering. It makes us almost unsteady to have that much power to tap into. Then it says, "The teacher of God needs this period of respite." (OrEd.Mn.4.8) We need this little time to settle in, just to relax for a few moments. We need that period of time. "Yet when he is ready to go on, he goes with mighty companions beside him." When we gather, we gather with "mighty companions." We are all "mighty companions" with one another. We are strong partners for each other in the work that we have to do and in the maintenance of our own peace. "Now he rests a while and gathers them before going on. He will not go on from here alone." (OrEd.Mn.4.8) So while we are in this period of respite with our "mighty companions," it is important to understand that we are gathering these people and that when we go on to do the work that is here for us to do, we don't go on alone to do it. It's not a lonely journey from this point on, because we have gathered. We have grouped together our mighty companions. We are all that for each other. If you look at the picture on your program, you will see that the picture is one of the great historic gatherings of all times. It is Woodstock. And if you look at the picture here on the wall, there is another picture of this great gathering. It's another picture from Woodstock. Rev. Rudy tells me the picture is of Joe Cocker playing, right? (Rev. Rudy nods that this is correct.) This is Joe Cocker when he sang at Woodstock and the huge crowd that was listening3. I thought it was amazing that Rev. Rudy was inspired to put a picture on the wall of one of the greatest gatherings, historically, of all time. Woodstock had such a huge cultural impact on the world. Let's absorb that energy, share it now, and spread it. It's on your program here, and it's on the wall. It is so important to gather. It changes the world when we come together. When those with like minded thoughts, "... can get together and have three days of fun and music ..."4 you literally do change the world. That's what we do with the miraculous energy that we've connected with and with the mighty companions that we connect with when we gather. We take our place in the Great Awakening, not only for ourselves, our friends and family, our community – but for the whole world, really for the universe as a whole. That becomes our transcendent purpose. That becomes what we are here to do, be part of that Great Awakening. In another place A Course in Miracles, talks about the same thing, but it uses slightly different words. It says, "As you share my inability to tolerate lack of love in yourself and others, you must join the Great Crusade to correct it." (OrEd.Tx1.31) So this time it is calling the "Great Awakening" the "Great Crusade." It's the great crusade to correct lack of love, lack of love in ourselves – to identify when we don't feel centered in that love – and lack of love in others. We must identify all perceptions of lack of love and then ask Holy Spirit, "What can I do to be a healing influence in this situation that appears to be a lack of love, or fear, anger that someone else is experiencing?" How can I be a healing influence in that? That is the Great Crusade. That is the Great Awakening. That is what we are all taking part in. We are the mighty companions for each other to do that. I think this is very important to understand. It is for me. It's been important in my life. It's been what centered my life. Until we really accept our part in the Great Awakening and the Great Crusade, there's really nothing for us to do here. We are just spinning our wheels, off on little ego things that are going on. I'm reminded of the teaching of Robert Bly, who was very instrumental for me many years ago. Robert Bly, for those of you who don't know, was a writer and a poet. He was very instrumental in the men's movement that began about twenty-five years ago. Iron John was originally published in 1990. Robert Bly wrote this seminal book that many people believe started the modern men's movement named Iron John. I remember reading Iron John, and I remember listening to the Iron John audio book. It was truly a book written for men and men's consciousness, but it can apply to everybody. One thing that I remember about Iron John is that men, everybody, go through a stage, usually in their adolescence and early lives, when they lack direction. Robert Bly equated that time to an American Indian, or a First Nation people cultural time, when the young adolescent boys didn't know what to do. They would roll around in the ashes, in their tents, in their wigwams or wherever. They laid down next to the tribes' fires and they rolled around in the ashes. They didn't know what to do with themselves. They usually were not clean. Robert Bly called this their "ashes time." That is where the expression "ashes time" comes from. We probably all go through our own ashes time. However when the adolescent eventually connects to a higher purpose, to a transcendent purpose, then the adolescents rise from the ashes. Then they arise into their full power and they became adult men with a transcendent purpose. Until you have a transcendent purpose, you are just rolling around in the ashes. I think that is true for me. I want to put that out here, at the beginning of the year. It's time for us, in whatever respect, to say goodbye to our ashes time – rolling around in the dirt the dust, and the ashes. It's time to really connect with our transcendent purpose, with that Great Awakening, with the Great Crusade. Another analogy about the ashes that I think is so important is the phoenix. The phoenix is a mythological bird with huge, tremendous powers. The phoenix periodically goes through a transformation which begins with a dissolution, when he/she loses his/her power and crumbles into disintegration or ashes. But then the phoenix, a new phoenix, always "... rises from the ashes." That's the expression. "The phoenix rises from the ashes." When the new phoenix rises from the ashes, the new phoenix has new powers that the old phoenix didn't possess. It has new powers to dedicate to its new transcendent purpose. This is why we're all here. The new powers of the phoenix are here for us to have. This rebirth is a reconceptualization of Community Miracles Center, a new visioning. It's CMC rising from the ashes. It's about a reconceptualization of our Sunday – what we used to be called a "Sunday Service," we are now calling a "Sunday Gathering." We've added live music every Sunday. Thank you Eki for being our first musician. (cheering) We're going classy so we've added Ritual Coffee. I don't know if you've had that coffee. That is considered the best commercial coffee in the world. It costs more than $20 per pound – Ritual Coffee. Go into any Ritual Coffee store and they will give you the rap about why it's the best coffee in the world. They don't over roast it. They say every other coffee in San Francisco is burnt which I agree with. So they don't over roast their coffee, and there's lots of other wonderful things about Ritual Coffee that I won't get into now. When Rev. Rudy first showed Rev. Kelly and I this space, he didn't tell us that he had that actual quotation on the wall. If you turn your heads you will see that huge print on the back wall. On that print Rev. Rudy put the holy encounter quotation. I said to myself, "The writing is on the wall. The writing is on the wall." (laughter). This space, seemed unusual, but it was beautiful. I thought, "This is going to be our space? This was going to be our space." We were going to make this space work. Look at it. It is beautiful. It is working. We've got stained glass! (laughter – The window in the new meeting area is actually a stained glass window). We have really gone cathedral here with stained glass. (more laughter) So that's why we gather. We gather to connect with this energy of Community Miracles Center because Community Miracles Center is dedicated to that Great Crusade and that Great Awakening. Now the title of this talk is "Why We Gather on Sundays." I want to get into that a little bit. We gather on Sundays because countless millions of other spiritual people, religious people, gather on Sunday. They are probably not our faith. Maybe their beliefs are very different from ours, but they are aspiring to their highest mind, the highest mind that they can aspire to. Maybe they are of the Jewish faith; maybe they are of the Muslim faith. Maybe they are Christian; maybe they are Buddhist. It doesn't really matter. There are countless people all around the world right now, or maybe a few hours before because of the circling of the globe, but right at this time, millions are connecting to their highest thought. 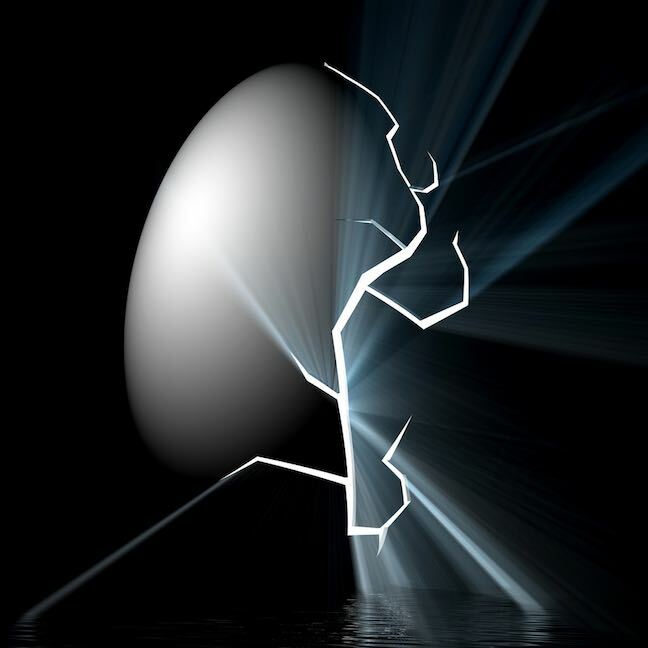 All of those people connecting to that high, high thought cracks the cosmic egg that we look at. It cracks, and this allows more light to come in than would normally come in at other times. You cannot deny the power of countless millions of people gathering on Sunday right now. So that crack is wider now than it is at other times. So that's why we gather on Sundays, to experience the light and the love that is coming in through that wide crack. I love that analogy of the crack. I first heard about this crack many, many years ago with a book that was written in 1971 by Joseph Chilton Pearce named The Crack in the Cosmic Egg, a very seminal book. I read it. It was very influential in my life. I found out that he just made his transition this year. He was 90 years old. Joseph Chilton Pearce, in that book, talks about how we each are a consciousness that is surrounded by this egg like thing. The interior of the egg shell is a mirror. It's only a mirror. Sound familiar? So we look at it, we look out, and we see only ourselves. We just see ourselves. We don't understand that there is this whole other reality outside of the egg. But there is a part of our mind, at times, that does understand this. 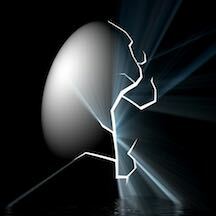 That part of our mind puts little cracks here and there in the surrounding egg at different times. You have got to start looking for the cracks. That is what you've got to do. You start looking for the cracks, and then you expand them. You let more light in. That is what I believe. I read this book a long time ago, but I believe that is the major teaching of that book. Sunday gatherings – because of that combined thought held by countless millions of people – that's a big crack. That's why we especially gather on Sundays, because of the wide crack that is produced by all of those wonderful, spiritual minds thinking the highest thoughts that they could possibly think. I also like the crack analogy because there's a famous song by Leonard Cohen which is named "Anthem," which he recorded in 1992. That is twenty-four years ago. I sang that song at the 2007 A Course In Miracles Conference in San Francisco, if you remember. Well actually my "sister" Rev. Antoinette sang it. (laughter) Leonard Cohen just transitioned a month or so ago. I love Leonard Cohen. He's been a force in my life for decades and decades. In the song, "Anthem," he says "There's a crack in everything. That's how the light gets in." He uses that analogy. It doesn't matter that we are not perfect. It might not matter that this meeting space isn't the perfect space. The imperfection of it is the crack. That's the crack. That's the beauty. That's what is letting the light in. There is no perfection here in this world, but the imperfection itself is the beauty and is the light. "There's a crack in everything. That's how the light gets in." Thank you, Leonard. I've always loved Leonard. Leonard Cohen, as you may know always wore a fedora when he performed. I wear a fedora too. I want you to know that I started wearing a fedora before Leonard started – he copied me. 2. ACIM Gather is a room/channel on PalTalk, an internet based, audio chat/radio service. To join PalTalk go to: < http://paltalk.com >. After you join search for the ACIM Gather room and listen to our Sunday Gathering LIVE every Sunday at 11 a.m. Pacific. 3. It is estimated that between 400,000 to 5000,000 people attended the Woodstock music festival. 4. This quote is from the farmer Maz Yasgur's famous speech at Woodstock. The festival was "saved" at the last minute because Mr. Yasgur agreed it could happen on his farm land after the rights to have it in Woodstock, NY were revoked. The Woodstock concert was not held in Woodstock, NY. 5. 2269 Market Street, San Francisco CA was the address for the old CMC office and meeting space that was left on December 31, 2016. CMC was at 2269 Market Street for more than 29 years. Rev. Tony Ponticello is CMC's 20th minister. He currently serves as the CMC's Executive Minister (09.03.2018). He is also the President of the CMC Board of Diretors. He was ordained by the CMC on Oct. 17, 2097. This article appeared in the January 2017 (Vol. 30 No. 11) issue of Miracles Monthly. Miracles Monthly is published by Community Miracles Center in San Francisco, CA. CMC is supported solely by people just like you who: become CMC Supporting Members, Give Donations and Purchase Books and Products through us.